Lively and vibrant Sinaw Souq is the main meeting place for the Bedouin where camels, goats and calves are auctioned and bartered. Bedouin women in traditional dress, complete with shiny metallic face-mask (burqa) trade side by side with the men and in some of the silver shops you can still find the traditional old silver Bedouin jewellery. 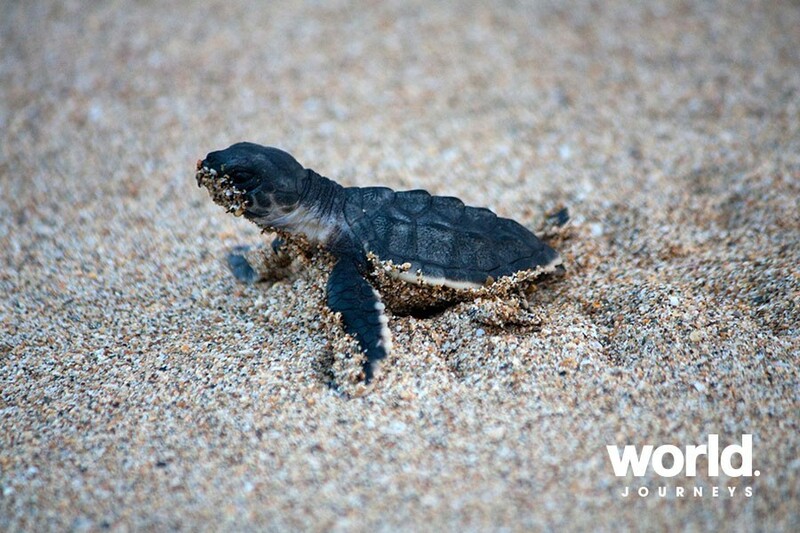 Take the opportunity to photograph and watch turtles laying eggs and hatchlings emerging from the nests and heading for the sea. Ras Al Hadd is a strategic point, whose sea and lagoons was once a haven for pirates. Walk through the maze of streets in Sur, revealing many fine old houses with carved doors and arabesque windows. 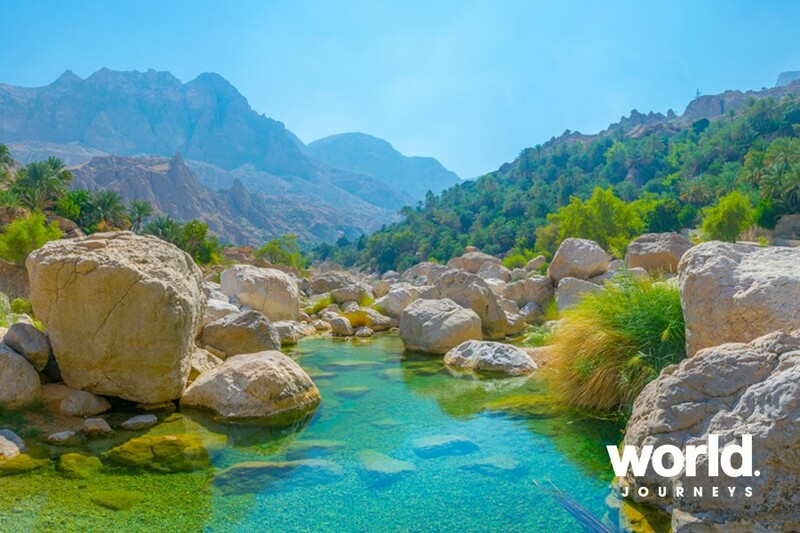 Explore enchanting wadis with deep pools ideal for swimming. 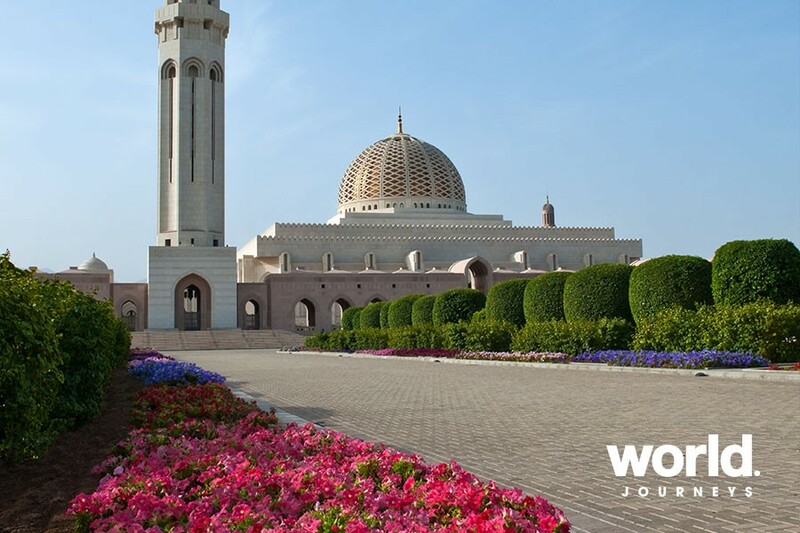 Experience all this and more on our Oman Highlights programme. Day 1: Arrive Muscat Arrive at Muscat airport, and you will be assisted through immigration and visa formalities. You will be met and and transferred by our representative to your hotel. Enjoy lunch at Souq Cafe. Later in the afternoon you will be met at the hotel for a "Muscat by Night" tour. You drive along the Corniche, passing the port of Muscat, continue on the road through the coastal mountains to Qurum and on to the Grand Mosque. The tour ends at Kargeen restaurant, where you will enjoy an Arabic theme dinner. Return to the hotel after dinner. Day 2: Muscat City Tour Early in the morning, you will be met at the hotel for a half day city orientation tour. You visit the Grand Mosque, one of the largest mosques in the Middle East, followed by the Natural History Museum. Drive along the picturesque Corniche with a photo stop at Al Alam Palace, the residence of his Majesty Sultan Qaboose. The palace is flanked by the 16th century portuguese forts, Mirani and Jalali. Before winding up the tour you will be strolling through Muttrah Souq and then return to the hotel. Enjoy the Lunch at a Rumba Latina restaurant, The Cave Muscat. Drop off to hotel. By evening, transfer to Bait Al Zubair Museum for a visit followed by a sunset cruise along the Muscat coastline on a Traditional Omani Dhow (only on Mon, Thu, Fri & Sat) followed by dinner at a restaurant on the cornice. Later transfer back to hotel. 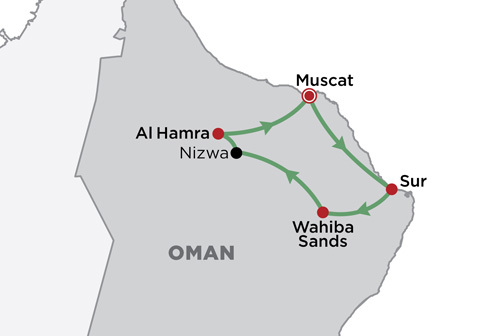 Day 3: Muscat > Sur After check-out at the hotel, you start your fascinating roundtrip with the first leg taking you in south eastern direction along the coast to Sur. The road leads through scenic countryside and rugged mountains to the Wadi Dhaiqa Dam. Stop at the limestone Sinkhole in Bimah and then continue to Fins. Enjoy the white sandy beach at Fins proceed to visit Wadi Tiwi, an oasis well known for its lemon and date plantations. Enjoy your lunch overlooking the beautiful sea. 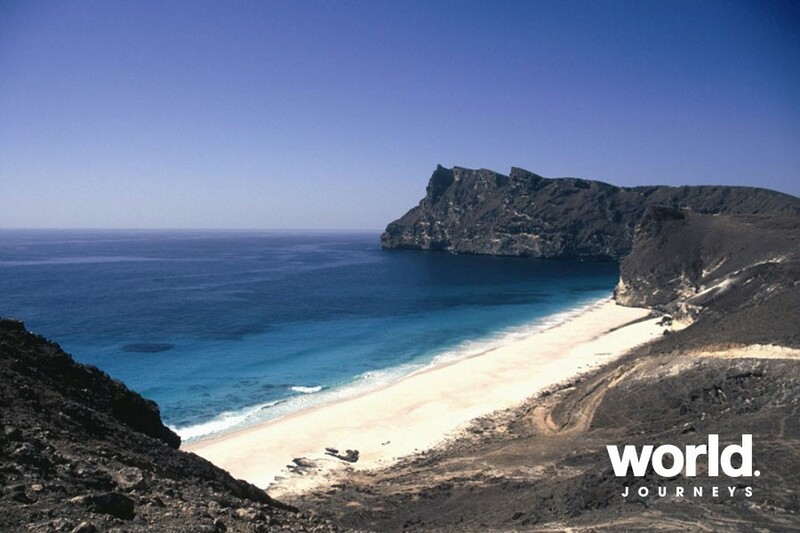 Then proceed to the coastal town of Sur, where you will check into your hotel. After an early dinner at the hotel you will visit the turtle sanctuary at Ras Al Jinz. Return to Sur Hotel for the overnight stay. Day 4: Sur > Wahiba Sands After check out at the hotel you will first be taken on a short tour of Sur, renowned in former times for its shipyard, where the dhows, the traditional wooden Omani boats were built. Later we proceed to Wadi Bani Khalid, an oasis spot in the middle of the barren and dry mountain. A picnic lunch will be served here. The afternoon is reserved for your desert experience. 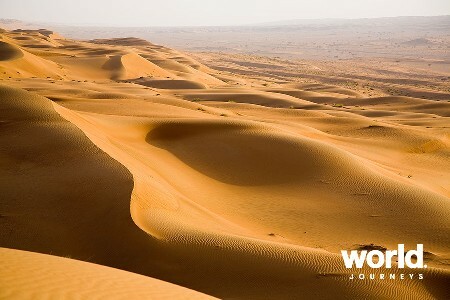 You drive into the Wahiba Sands, a vast mass of undulating red and white sea of sand. After some exciting sand dune driving with your experienced driver, you may want to go on a camel ride or do some sand skiing before visiting the home of a Bedouin Family in the desert. You will experience traditional Arabic hospitality with coffee and date you will arrive and check-in at the 1000 Nights Camp. Enjoy a BBQ dinner with Omani music and a dance show. Overnight at 1000 Nights Camp. Day 5: Wahiba Sands > Nizwa > Al Hamra After breakfast proceed to the historic town of Nizwa, Oman's cultural capital. Nizwa's main places of interest are the Souq and the Nizwa Fort, one of the impressive forts in Oman and then to Jabreen castle. Later proceed to Al Hamra, one of the oldest villages in Oman. Lunch at a local restaurant and later drive up to Jabel Shams, which literally means Mountain of the Sun. Experience an untamed and rugged countryside at Oman's highest peak at 3000 mtrs, often hailed as the Sultanate's own version of the Grand Canyon, Later drive back to hotel for dinner and overnight stay. Day 6: Al Hamra > Muscat After leisurely breakfast visit the hidden and remote village of Misfat Al Abryeen. Embark on a heritage walk through the many plantations in the village to learn about the Falaj system. Drive back to Muscat. Day 7: Depart Muscat Day is at your own leisure. By evening, you will be transferred to the airport for your flight back home. Some vigorous 4WD experiences are included in this programme. Please check with World Journeys for suitability if you have back or heart problems. Based on a minimum of 4 people travelling together. Supplements will apply over peak periods.